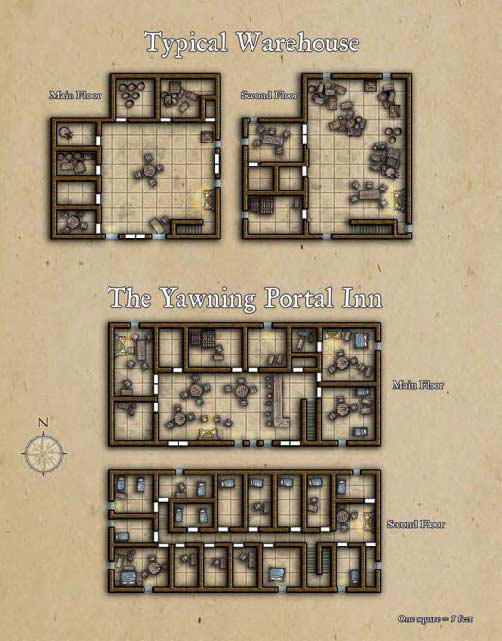 The Yawning Portal Inn stands on Rainrun Street in the city’s Castle Ward, two doors west of The Empty Keg Tavern. 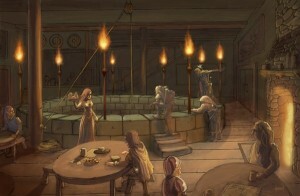 Right next to the inn, between it and the Keg, stands Mother Salinka’s House of Pleasure, a shabby, low-coin festhall. The Yawning Portal Inn is built of stone, with a slate roof and an upper floor of guest rooms. Like both of its neighboring businesses, the inn announces itself to the watching world by means of a hanging signboard. The sign reads simply, “The Yawning Portal.” The words are deeply carved in a board weathered to a silvery hue that hangs by two short loops of chain from a black-painted iron pole above the front door. Durnan the Wanderer, a human, built the inn atop the foundations of the long-vanished tower and fortified warehouses of Halaster Blackcloak. Inside, the place is rambling and dingy, but it gives the impression of being comfortable rather than dirty and forbidding. Well-worn boards cover the fl oor. Wood paneling adorns the walls, with an elbow rail usually crowded with not-yet-empty tankards. Rich blue tapestries hang at intervals along the paneled walls. Guests entering from the street step right into the inn’s common room, which is mostly used for dining and drinking. The Entry Well that leads down into the Dungeon Level of Undermountain dominates the area. Some of the tables in the common room can’t be moved; they’re built around wooden pillars that hold up the ceiling.All the furniture is heavy, stout wood. Lighting is provided by candle-wheels (chandeliers made of horizontal wagon wheels hung from the ceiling by chains and filled with thick, lit candles). Handy mops can serve as improvised quarterstaffs or reaching aids for adventurers needing a hand to clear the top of the Entry Well. Unruly drunkards are usually handled by adding a powerful sleeping powder to their drinks, but Durnan has been known to lift men into the air and toss them bodily through the front door to see how far they fly before landing. There are three floors of guest rooms, reached by steep wooden stairs opening off the common room. In winter, the rooms are heated by warm stones (barrel-ends with rope handles, filled with rocks warmed at the fireplaces at the east end of every floor’s central hall). The infamous Entry Well is an open-topped stone ring 40 feet in diameter. A 1-foot-thick rampart wall rises waist-high, encircling air that drifts straight up from Undermountain. The outside of the well wall is studded at intervals with iron torch brackets, and a block-and-tackle hoist is chained to a stone lintel in the ceiling directly over the well. The well’s dry shaft descends 140 feet from the lip of the rampart to the sand-strewn stone floor of the Dungeon Level of Undermountain. The shaft tapers as it descends, from 40 feet across at the top to 30 feet across at the bottom. Those desiring to enter Undermountain are expected to provide their own weapons, gear, and light sources. Simple torches and belt flasks of water can be bought from the inn (1 cp each). A fee of 1 gp per person must be paid to Durnan to use the well. You can climb on your own or get lowered by the hoist, as long as you pay the fee. Upon return, the same fee is required to get lifted out of the well. The fee (or its equivalent or better in another currency, such as gems) must be put in the hoist’s bucket, brought up, examined, and then accepted before the hoist is used to retrieve returning adventurers. The 200-foot-long rope of the hoist is as thick as a human’s wrist and stout enough to hold the weight of ten armored and heavily laden humans. It ends in a metal hook that usually has a stout wooden bucket affixed to it. Tied through the eye of the hook, as well as the hoist-rope, are two stout leather loops that can be wrapped around a body or clung to, and above the hook, at 2-foot intervals, wooden crossbars have been woven through the rope, to serve as ladder rungs. Durnan normally works the hoist alone. Not much strength is required to operate it, since the pulleys do the work and the hoist-winch has cogs to prevent the rope from slipping back down the shaft. A release lever can be deliberately pulled to send any weight on the rope plummeting to the bottom of the well, should Durnan decide that whatever is rising shouldn’t be allowed to reach the top. If Durnan’s absent, any other member of the inn’s staff can work the hoist. One Response to "Yawning Portal Inn"